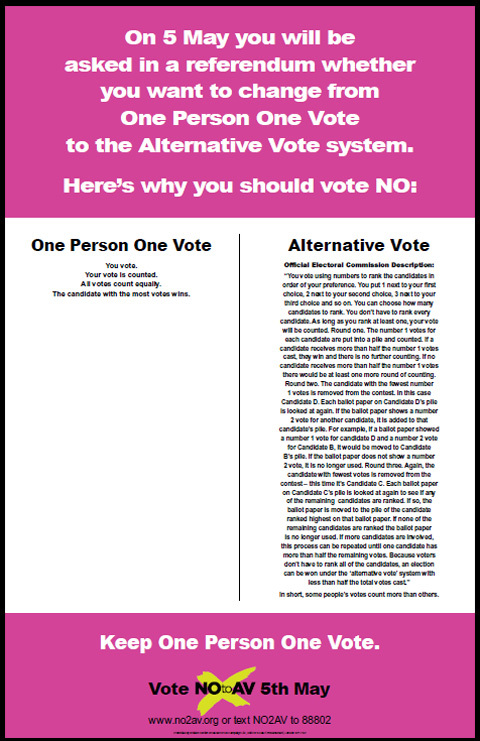 The ‘No’ campaign have released a very powerful poster that communicates the complexity of the Alternative Vote system. People find politics confusing and complicated at the best of times, so telling the electorate that a new system may be even more mystifying is bound to make them react against it. ‘One person, one vote’ is also a founding principle of democracy in the minds of most people, so by insinuating that a new system might affect that cornerstone, this poster will certainly rile up those less informed about the detailed implications of the referendum. This poster also allows the ‘No’ campaign to claim that it’s educating the electorate about the facts, rather than slinging mud. In fact, the implication that AV would end ‘one person, one vote’ in the broader sense – as opposed to the fact that one will be able to enter votes preferentially – is one of the more misleading claims that has been communicated in the campaign thus far.